About Wet Basement Heroes Inc. Wet Basement Heroes Inc. serves most of Southern Ontario. We are near Hagersville, Brantford, Tillsonburg, and Waterford. We also service Simcoe, Paris, Jarvis and surrounding areas. We are your basement waterproofing experts in Southern Ontario. Working together with our neighbours completing work based on mutual trust, respect, openness, teamwork and integrity. Work with a local contractor from your community. Enjoy peace of mind, knowing the job will be completed correctly the first time. How water enters the home. Eastern Canada’s, freeze and thaw cycle can result in water leakage. Most Ontario residents generally feel the effects of this leakage in their basements. Basements are usually built either at ground level or below, ground water, and sometimes inadequate drainage systems cause pressure called hydrostatic pressure to increase against basement walls until finally it results in leakage. Basement Waterproofing can be used to counteract the “leaky” effects of hydrostatic pressure. Water does more than just damage your basement. Leaky basements and untreated water problems creates mould and can disrupt your families life. Wet Basement Heroes Inc. can repair your leaky basement problem quickly and affordably. Water can also harm the structural integrity of your foundation. With over 20 years of basement waterproofing in Southern Ontario. Wet Basement Heroes Inc. experience in solving your wet basement is second to none. Untreated leaky basements can significantly lower your homes value. 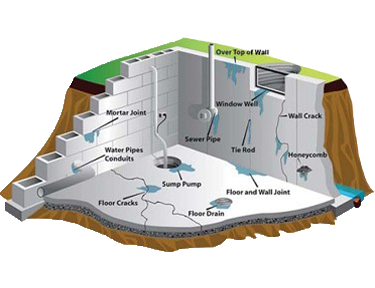 Wet Basement Heroes Inc. has the solution for the water in your basement or a deteriorating foundation in the Brantford, Ontario area. 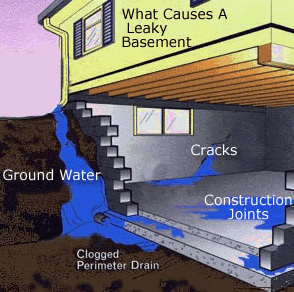 leaky basement can not only change how you use your basement but also damage your foundations integrity and lower your home’s value, thus presenting costs that will be a deterrent to a buyer or force pre-sale costs out of your pocket.